The most difficult part for me was not the fever or the crying, but the fact that my super-chatty superhero was not able to speak. His innovative Auntie came up with a series of signals that had him smiling and giggling at least, and I tried to intuit as best I could, but communication was a challenge (for once). I realized how much I take language for granted, and how blessed I am, actually, to have a kid who, under normal conditions, does not stop talking, from the moment his eyes open with the sun til the moment they shut (usually against his will and after a minimum of three bedtime stories.) Universe, if I ever wished for this kid to shut up, I take it back! I prayed. And I’m grateful that this period is fleeting, a blip in the timeline of his childhood, I give so many props to the mamas and the papas of kids with special needs, I really do. When I was his age, there was a book I loved to read. It was printed in old block style, in only one color, indigo. The book is called Blueberries for Sal by Robert McCloskey, published in 1948. 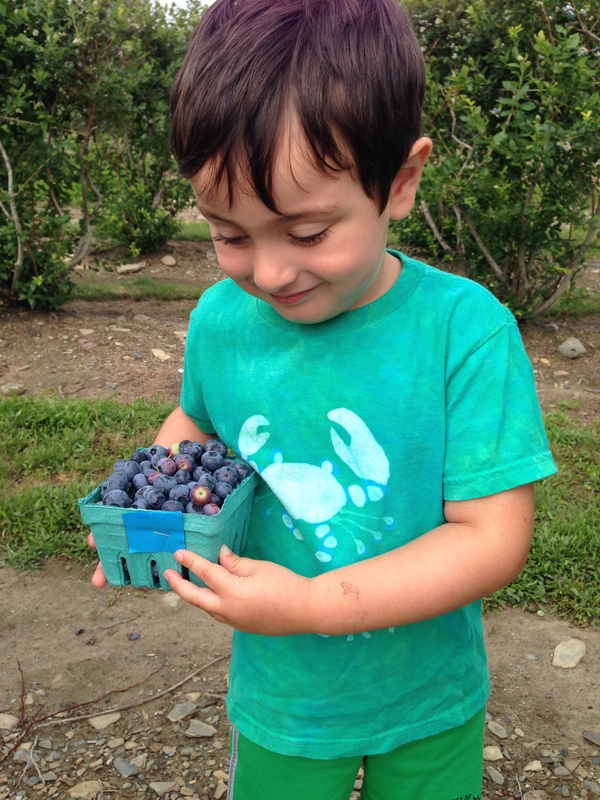 In it, a little girl named Sal and her mama go out to pick blueberries to can for the winter. At the same time, a little bear cub and his mama start out on the other side of the hill, picking and eating the blueberries. I won’t spoil it for you (or your little ones, please find a copy and read it to them!) but I will say that the book makes a connection between the human and animal mother/child pairs, and it is a sweet one. It also makes us keenly aware of language vs. the other senses and forms of nonverbal communication. This whole experience this week reminded me of this book. An interesting exercise, vacation is. Sickness too. These experiences take us out of the normal routine of our lives, and give us pause to consider how we’ve been doing things. I like to take my vacation at sort of the midpoint of the year, around my birthday, a second “new year”, if you will. To reflect on the first half of the year and reset for the next half. To recharge my batteries, but also to unplug from everything and reconnect to my self, my family, my relationships, my health. Even if you love every minute of your job, it’s good to do something different for awhile. It’s good to get out of the city and pick blueberries. It’s good to be taken care of when you are sick. It’s good to be so in love with your mama you want to marry her (if you’re a 3 year old boy) and it’s good to know that the blueberry trees, and the ocean waves are here all year long, not just while you are visiting. So anytime you need a moment throughout the year you can close your eyes and come back to this moment, to this lesson, and reapply as needed.